I hope everyone is recovering from a safe, and wonderful holiday season. I know we are. Several days of family get togethers that included a lot of cooking not only resulted in good times, but with that a bit of exhaustion. I was really pleased with my Christmas day menu this year. At first, I was going to put together another porchetta, but instead decided to make a herb and garlic crusted New York strip roast (that was to die for) along with an array of roasted vegetables, a mushroom gratin, as well as shrimp done two ways. One way being drunk. Yes, drunk. Drunken shrimp are just that, shrimp marinated in some good quality booze. 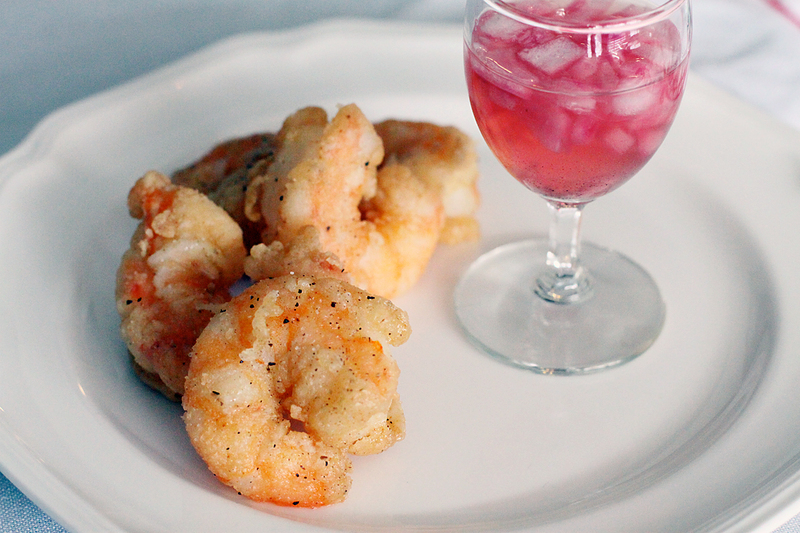 The result is a crispy shrimp with a hint of that boozy flavor. Everyone loved them. These are a great appetizer to get any get together started. Start by marinating your shrimp. Add them to a large ziplock bag, pour in the tequila, seal the bag, giving it a good toss, and then set in the refrigerator for a maximum of two hours. During this time, make the sauce. Add all of the sauce ingredients into a small mixing bowl to combine everything, and stir to dissolve the sugar. Cover and set aside. This can be made a day ahead as well and can be stored for a few days, if not longer. Before you are ready to fry the drunken shrimp, add the flour, corn flour, teaspoon of salt and pepper, and cayenne pepper to another ziplock bag. Seal, and shake the bag to combine the seasonings and flour. Bring a pot of oil up to temperature, around 350 degrees. The oil can be ready by placing the handle of a wooden spoon into the oil. If it bubbles somewhat aggressively, the oil is most likely ready. Drain the shrimp, then add them to the flour mixture. Seal the bag, and give the shrimp a really good toss, ensuring that all shrimp are evenly coated with the flour mixture. Add enough shrimp, working in batches, to the hot oil, being careful not to overcrowd them. Cook the shrimp for about 4-6 minutes or until they are golden brown, and crispy. Remove them with a slotted spoon onto a paper lined plate to allow any access oil to drain. Season with a bit of salt and pepper. Repeat with the remaining shrimp. When you are ready to plate, simply add the shrimp to a large serving plate, along with a small bowl of the dipping sauce. Serve by either dunking the shrimp into the sauce, and eat, or drizzle the sauce onto the shrimp. 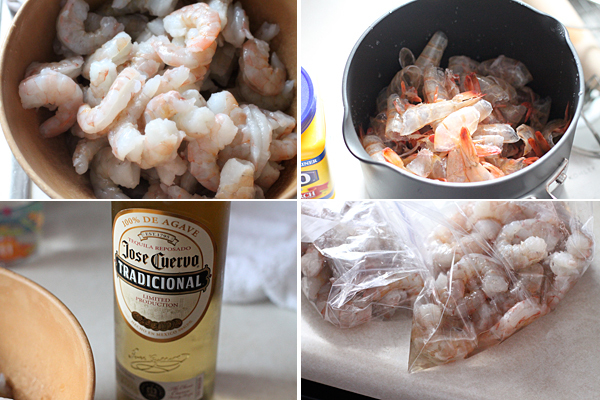 However you do it, the end result is a tequila marinated shrimp that has a punch of flavor. Crispy on the exterior, and soft and plump on the interior, these shrimp will definitely wake up your palette. My wife got the subtle tequila right away, and then that dipping sauce. It’s almost close to a traditional Filipino sauce. The bright vinegar, along with the garlic and onion, this sauce is sure to please. Feel free to use the leftover sauce on pretty much anything, it’s that good. So if you are looking for a nice appetizer, give this one a shot. I know everyone at the party loved them. Who knew a little bit of booze could go a long way? Hope you enjoy, and Happy New Year to everyone! Serve by either dunking the shrimp into the sauce, and eat, or drizzle the sauce onto the shrimp. However you do it, the end result is a tequila marinated shrimp that has a punch of flavor. Crispy on the exterior, and soft and plump on the interior, these shrimp will definitely wake up your palette. My wife got the subtle tequila right away, and then that dipping sauce. It's almost close to a traditional Filipino sauce. The bright vinegar, along with the garlic and onion, this sauce is sure to please. Feel free to use the leftover sauce on pretty much anything, it's that good. Hi Sarah! You got that right. Drunk shrimp eq HEAVEN! Hope you enjoy.